Michael is a Sydney-based writer for stage and screen. He has a passion for Australian dark comedies that subvert the familiar, dismantle archetypes, and create worlds of glory and ruin. In 2016 Michael co-wrote Visiting Hours – an immersive theatre production for Sydneyʼs Vivid Festival. His theatre writing credits include: The Canterbury Tales after Chaucer (New Theatre), The Silk Piglet (NIDA Independent), Seance for Zambini Smith (George Georgiou Inc), and Birthday Jones Beats His Bully (OʼKelly Productions). In addition, he was Head Writer of the inaugural University of Technology Sydneyʼs law revue, Prosecutor, Queen of the Desert. Michael is also the book and lyrics writer of a new musical, The Overcoat, after Nikolai Gogol. His screen writing highlights include Daisy, Ferguson and Ursula (which was awarded the Peopleʼs Choice Award at the Golden Eye Film Awards) Facebook Felons, White Heat and The Race. 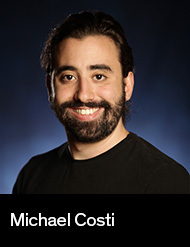 Michael has also worked as a Director on The Canterbury Tales (George Georgiou Inc at the New Theatre), The Good Person of Szechwan (Barker College), Accidental Death of an Anarchist (Epicentre Theatre Company) and The Merchant of Venice (Genesian Theatre). After completing his law degree, Michael worked as a food critic and arts columnist, before finally devoting himself to writing full time.